Home / Blog / Kelley Knickerbocker's "Vulnerable/Variable"
In April 2013, a site-specific group show took place in Tacoma, USA in conjunction with the Society of American Mosaic Artist’s (SAMA). It was called Transposition and the exhibition was held in the former Immigration and National Services Building (INS) which was converted to an arts and cultural enclave. Fifteen artists were invited to showcase their artworks. Among them was Kelley Knickerbocker, an artist who is always trying new techniques and innovating the medium she uses. Knickerbrocker is one of those contemporary mosaicists who venture in an entrepreneurial trial and error approach to the medium unlike the European mosaic practice. Her ”Vulnerable/Variable” piece was the result of a happy accident; She had grabbed a paper towel in order to absorb the excess water while she over-diluted black cement slurry. 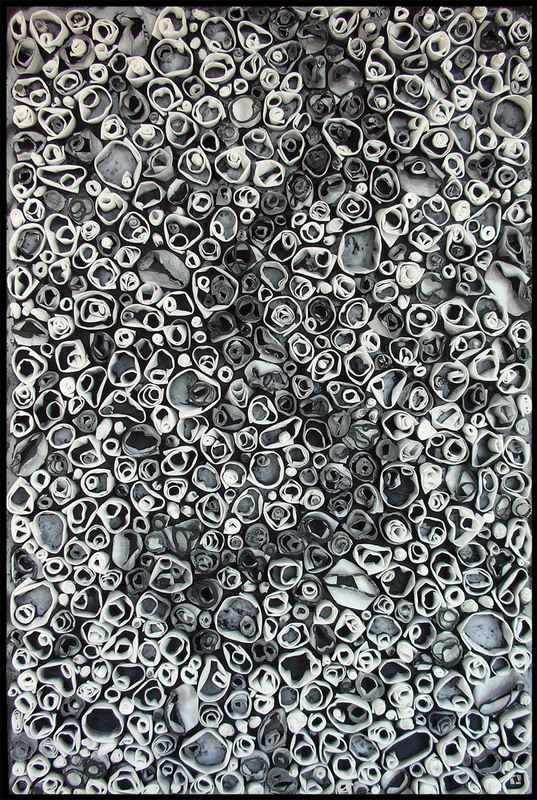 She ended up comparing the way the white fibers absorbed the wet black cement to the individual psyche. According to Knickerbocker, humans are inevitably shaded by the conscious and unconscious absorption of particular slurry of situational variables over time. They are vulnerable, sometimes breaking up under the weight of saturation, yet also astonishingly flexible. Lots of artwork is the result of “happy accidents”; can you think of some?